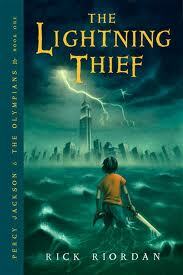 I try to keep up with what my kids are reading, and they’ve both enjoyed The Lightning Thief and the rest of the Percy Jackson series by Rick Riordan. (They also enjoyed the recent movie, but were quick to point out many, many liberties the movie-makers took with the story — to the point where it’s almost a different story). Parallels have been drawn between Percy Jackson and Harry Potter, but really, both are just riffing on an ancient theme — a pre-adolescent boy who, for various reasons, isn’t happy and doesn’t fit in, suddenly finds out he’s someone special. In Percy’s case, he’s the son of the god Poseidon, and he finds himself suddenly living in a world where gods and demigods, satyrs and others mythological creatures, are real — and often deadly. What makes Riordan’s spin on a tried-and-true formula fun and interesting is, first, the humour in the books, which is great, and secondly, the fact that reading these books will give your kids a good basic knowledge of Greek mythology, which they probably aren’t getting in school these days. I always tell my students what a first-year MUN English prof told me: if you want to understand English literature, you need a working knowledge of two things: the Bible and the Greek myths. We’re teaching less and less of both these days (and as a literature teacher, I can assure you it shows — hard to catch allusions if you’ve never been exposed to the original). The Percy Jackson books give young readers a nice intro to the basic myths of Western Civilization while keeping a good, page-turning story rolling right along. I love mythology- Egyptian is my especial favorite, but certainly Greek mythology too. While I am definitely going to read this series, I think I would have enjoyed more when I was a wee lass. His new series, starting with The Red Pyramid which is out in hardcover now, is based on Egyptian mythology. Emma has already read that one and liked it a lot! I had a lit professor in college who was the same way about Greek myths. She put a collection of Greek myths on our required texts list because she felt that every good literature scholar needed one on their bookshelf. I’m totally with her, too. The more familiar you are with these stories, the more you appreciate work like The Lightning Thief (which I really enjoyed). It’s the same thing with fairy tales. The more old tales you familiarize yourself with, the more you appreciate (or not) the newer spins. I felt the same way about this book — not just fun to read, but it really brought back a lot of the Greek mythology I loved when I was a kid. And it didn’t shy away from the scariness of it. I was always creeped out by Procrustes and now I have a name to go with the story (and now he’s a bed salesman, which just seems brilliant). This whole learning about mythology thing is a HUGE plus for me. And then, again, I don’t think that these books do any harm!